Dallas gained prominence as a center for the oil and cotton industries in earlier ages, but now it's a modern and vibrant city. 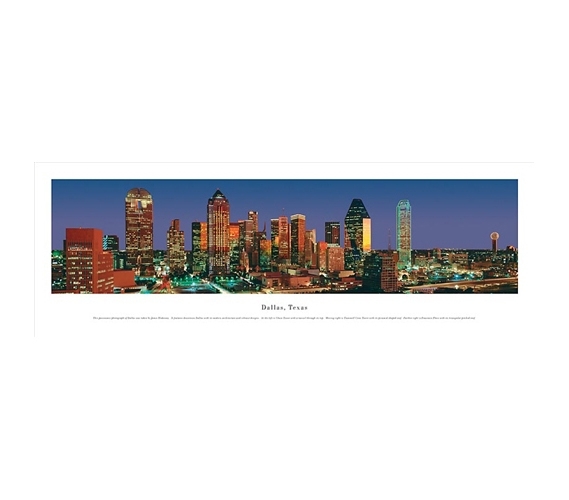 Let the lights of Dallas adorn your dorm walls with the Dallas, Texas - Vibrant Panorama. Dorm decor that captures bright city lights is just what's needed to offset the bland look of bare dorm walls. College dorm decorations start with wall decor for dorms, so add something that's like a poster but cooler. Your dorm items aren't complete unless there are some college wall decor products included. So go from barren to colorful and beautiful with our panoramas. 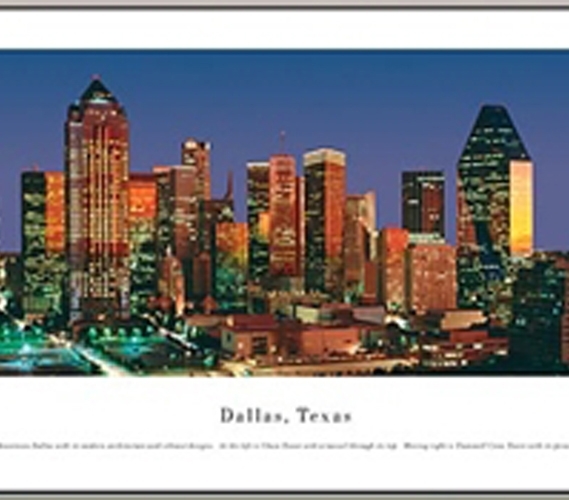 This panoramic photograph of Dallas was taken by James Blakeway. It features downtown Dallas with its modern architecture and vibrant designs. At the left is JPMorgan Chase Tower with a tunnel through its top. Moving right is Trammell Crow Tower with its pyramid shaped roof. Further right is Fountain Place with its triangular pitch roof. Green argon highlights the Bank of America Plaza, Dallas' tallest building at 72 floors. Reunion Tower, at the far right houses a hotel and revolving restaurant. While Dallas is often associated with oil, it has become one of the largest business and cultural centers in the Southwest.